I had just finished up a Tabata Protocol workout on the Santa Monica stairs, and suddenly a burger made a lot of sense. Short Order had recently opened up at The Farmers Market. Parking was a breeze, and Short Order validated, so the first two hours were free. I ordered a $13 Nancy's Backyard Burger, since it was the one made from 28-day dry-aged beef. My wait was just under 6 minutes. The Beef: The beef in Nancy's Backyard Burger was the star of the show. It was sourced from Magruder Ranch in Mendicino County. The beef came pre-ground from the supplier. The cuts in the blend were a mystery to both the kitchen and wait staff. It tasted strongly of Sirloin. The flavor was beefy. There was a mild and smooth taste of aged funk. The steaky mineral notes were there. Beyond the beefy goodness, there was a nice woody flavor from the wood-fired grill in the kitchen. The staff claimed that the patty weighed in at 7 ounces, but I thought that 6 was closer to reality. The fat content was just above 20%. The burger patty was juicy and satisfying. The bite was tender. The Seasoning: The exterior of the patty at Short Order was lightly dusted with a salt and pepper blend. The seasoning was correct for the undressed version of the burger, but it was no match for the toppings in the fully dressed version. The Sear: The Sear on my burger at Short Order was listless at best. The thin, flat patty could have done with a lot more heat to deliver a proper sear while maintaining a Med-Rare cooking temperature. The Preparation: I was told that the burgers were formed to order. The kitchen staff numbered 6 at the time of my visit, so this was plausible. The beef arrived pre-ground at medium coarse. 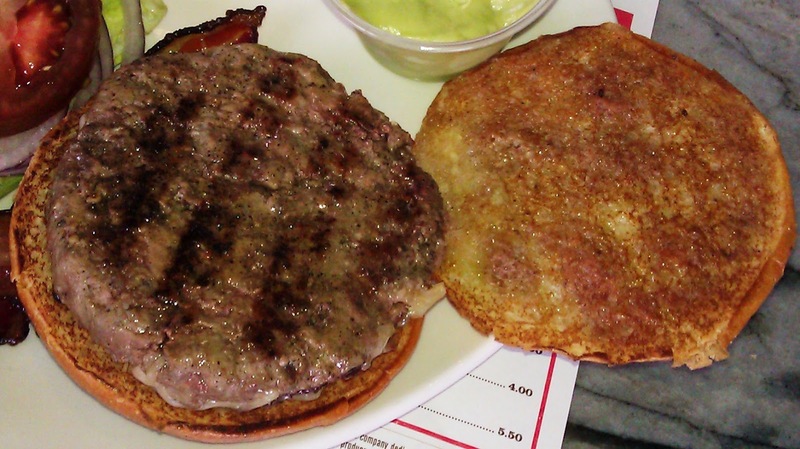 The burger patty was gently formed, and the beef was not over-manipulated. The burger was faithfully delivered at the Med-Rare cooking temperature request. 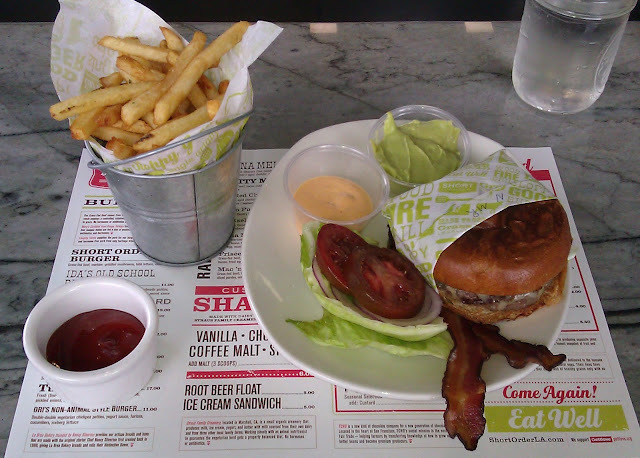 The Cheese: Nancy's Backyard Burger was served with Comté, an unpasteurized, French, cow's cheese. The cheese was where the burger took a turn for the worse. The Comté had a waxy flavor, which was closer to Swiss than Gruyere. It served to mask the perfect seasonings on the beef patty, and it imparted a wholly unwelcome chewiness to the dish. The insipid cheese did nothing in terms of complementing the beef. The Bun: The owner of Short Order, Nancy Silverton, also started La Brea Bakery, which was where the mild, brioche bun was sourced from. The bun was fresh, yeasty, and moist. The bun halves were toasted on both sides, but the bun still lacked any crunch. This, coupled with the lacking sear and the chewy cheese, led to a cheeseburger, which was dull in terms of texture. The bun was heavily oiled, and this started the dish down the path toward becoming a legitimate gut bomb. The Meat To Bun Ratio: This was perfect for the undressed version of the burger. The bun failed miserably when it contended with the host of wet toppings, which accompanied the burger. The Toppings: Bad to worse. Undressed the burger at Short Order was quite good as long as one peeled away the chewy cheese. Fully dressed, Nancy's Backyard Burger was sloppy and obnoxiously oily. Bacon--The smokey, thick-cut bacon was fine, but it was chewy rather than crisp. This made it both greasy and nearly impossible to bite through cleanly. Avocado--The burger came with a overly tart, whipped avocado topping. I was assured that this was freshly made in the kitchen. If it was, then the kitchen was wasting its time. This was just a way to ruin the subtle and creamy character of avocados. Special Sauce--This was a spicy mayo, so....more oil. Iceberg lettuce was partially wilted, so this contributed further to the weak and wet texture of the assembled dish. Heirloom Tomato--The tomato slices were juicy, but the flavors of the tomato failed to pop as I had expected. This tasted like a standard red tomato, and was on the mild side. The Fries: Short Order charged $3.00 for fries, which was steep considering that the burger was already $13.00. The fries were par-cooked and then cooked to order in canola oil. The kitchen cooked the cut in house, peel-on fries to a perfect golden brown. The fries were creamy. Sadly, the fries were over-salted, and this rendered them impossible to finish. The Value: No! A burger, fries, and a soda came to $20.66. This was far too much to pay for delicious beef in a poorly executed, wet, and oily dish. Short Order delivered burgers with great speed and efficiency from the gleaming kitchen. Sadly, the burger that they churned out was obscured by a variety of unpleasant and/or poorly considered toppings. The burger beef itself was terrific. The lack of sear and the overt greasiness of the dish, combined with the disjointed flavors and textures sent the whole thing into a culinary tailspin. 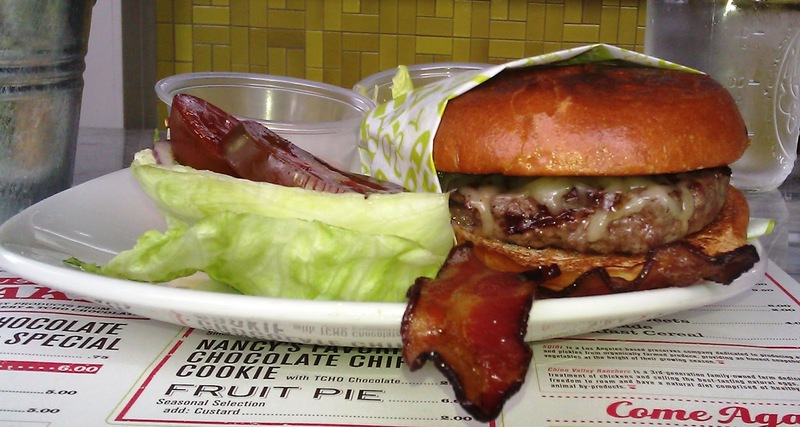 Burger Review : Nancy's Backyard Burger at Short Order was a study in "Too Much." Too much grease. Too much wet. Too much tartness. Too much money. Did you see the hype before this place opened? You'd figure two culinary powerhouses could figure out how to run a terrific burger joint. Nope. My conclusions were the same as yours. LA Times reviewed Short Order awhile back and despite acknowledging burger shortcomings, still gave a relatively favorable review. I doubt Jonathan Gold would approve.